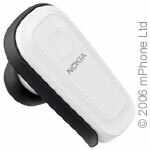 The Nokia Bluetooth Headset BH-300 gives handsfree a personal touch. The color of its innovative soft rim – which can be used as an optional ear loop - can be changed to your choice of dark grey, pink, lime green, or copper brown. Lightweight and easy-to-use, it’s wireless connectivity for your active life. Talk Time: 5 hours 30 min.